Nestled in between the Caribbean Sea and Pacific Ocean, Costa Rica is an enchanting and biodiverse land that spans over 51,000 kilometres, painted with towering volcanoes and rainforest-clad mountains, sparking coastal plains and amazing tropical beaches. 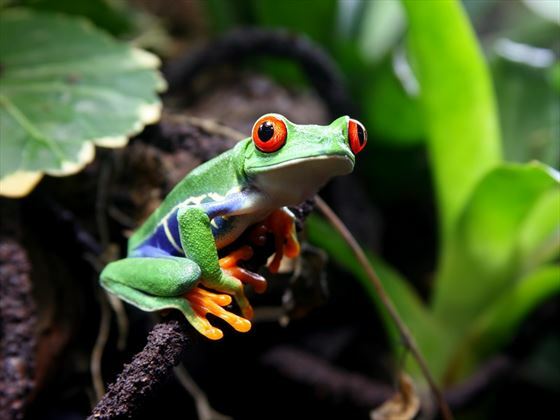 Costa Rica encompasses 12 distinct ecological zones, and is home to around 5% of the world’s biodiversity; the nation’s captivating environment and magnificent wildlife makes a paradise destination for nature lovers. 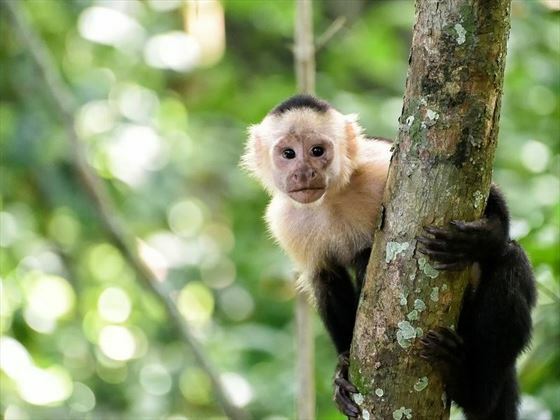 Throughout this unforgettable 11-night adventure, you’ll have abundant opportunity to observe and discover a magnificent wealth of wildlife, from the nesting turtles, sloths, manatees, monkeys and toucans in Tortuguero, to the world’s largest wild crocodile population, extremely rare scarlet macaws and majestic iguanas in Manuel Antonio National Park. Those seeking a rush of adrenaline will love the selection of activities available, including white-water river rafting, thrilling zip lining experiences and hikes across lava fields, whilst those in search of a little more relaxation will enjoy hot springs, luxurious resort facilities, river cruises and spectacular, slow-paced hiking trails (CL). Upon arrival in San Jose, transfer to your hotel and spend some time exploring the city at leisure. We recommend getting an early night in preparation for the beginning of your tropical adventure tomorrow. 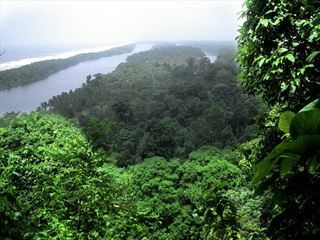 Today you will head to the Caribbean Lowlands and Tortuguero National Park, journeying through Braulio Carrillo National Park and past beautiful mountain vistas and Caribbean-style villages along the way. 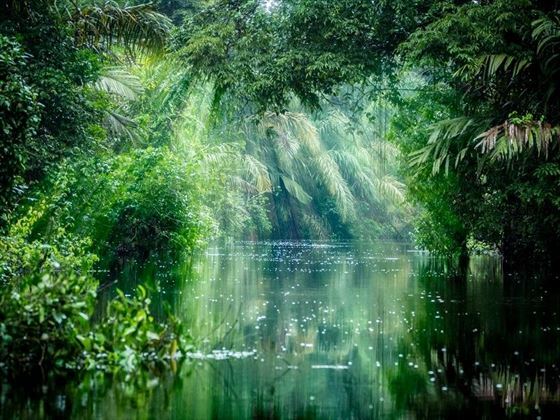 On arrival, you’ll discover the wonders of Tortuguero National Park’s rainforest as you cruise along the rivers and canals with an expert guide, keeping an eye out for native wildlife. Then, you’ll visit the world’s first green turtle research station to learn more about your surroundings; here, dedicated scientists are working to protect the turtle’s nesting habitat and eggs. 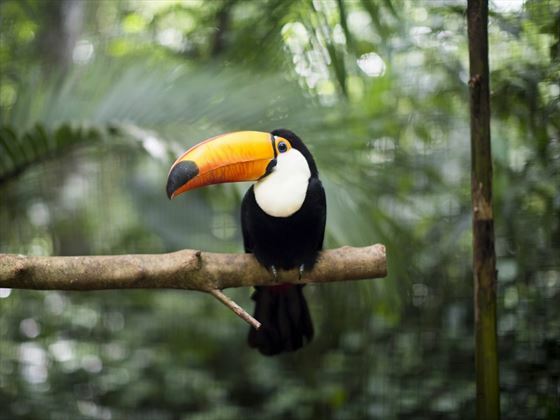 This evening, join your fellow travellers for a welcome reception and dinner, before residing in your comfortable eco-lodge accommodation, surrounded by lush tropical forest and an array of wildlife. Get your camera ready as you set out on an early morning birdwatching excursion, exploring a myriad of local and migratory birds in the area. 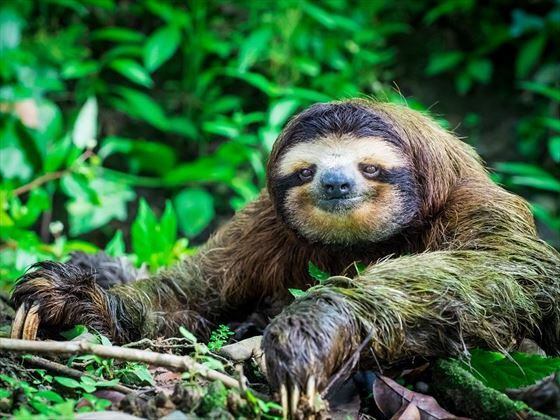 Next, you’ll embark on a nature cruise through the gorgeous national park scenery, keeping an eye out for howler monkeys, sloths, toucans and caimans. 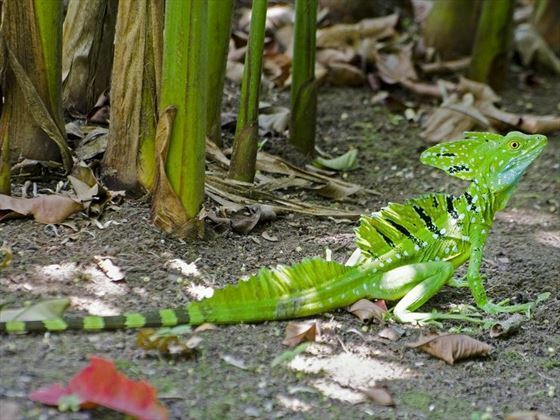 Tortuguero protects over 350 species of birds and mammals; enjoy time at leisure seeking out the green macaws and some of Costa Rica’s endangered species, including jaguars, tapirs, ocelots, cougars, river otters and even manatees. Take to the water again as you embark on a leisurely boat ride to the mainland, on the way to the Sarapiqui region, one of the world’s most important research areas for tropical rainforests. Arrive at your eco-lodge nestled in the rainforest, surrounded by towering Almendro trees, howler monkeys and keel billed toucans; after check-in, make a visit to a nearby cacao plantation, where you’ll discover the history and the significance of cacao to Central America’s economy. Observe the process of producing chocolate from the cacao beans, and sample the delicious product afterwards. This evening, you’ll enjoy dinner at a local biological reserve before returning to your hotel. Today will begin with a visit to an organic pineapple plantation, where you’ll learn about the variations of this exotic fruit, and discover why Costa Rican pineapples are some of the world’s finest. Then, you may experience the region from a different perspective during an exhilarating Sarapiqui River rafting adventure. Return to your rainforest lodge for some time at leisure – hike through the deep, tropical forest, or simply unwind in a hammock and soak up your beautiful surroundings. Later this evening, enjoy a traditional Costa Rican dinner with the rest of your group. After breakfast, start the day with an early-morning birdwatching tour along the natural forest trails leading up to the picturesque nearby stream. 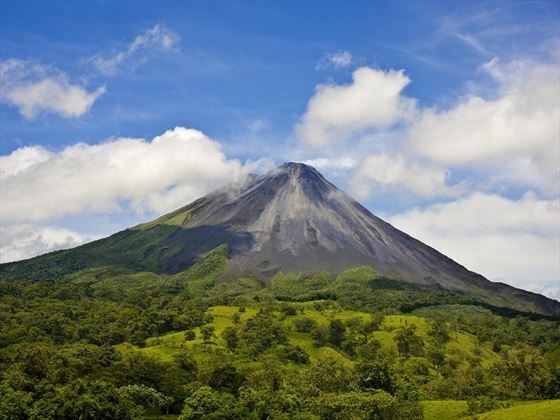 Later in the afternoon you’ll transfer to your hotel in Arenal, boasting magnificent panoramic views of Arenal Volcano and its stunning surroundings. 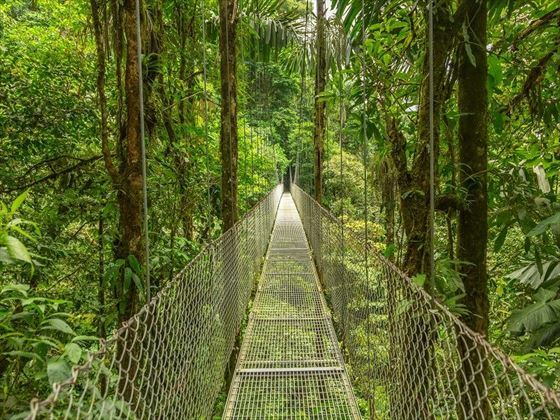 This morning, you’ll enjoy a guided walking tour along Arenal’s hanging bridges, showcasing phenomenal views of the rainforest from the treetops. 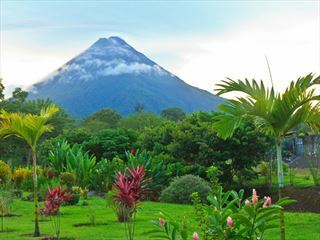 Then, you’ll have the choice of embarking on a thrilling zip lining experience for one-of-a-kind views over the Arenal Rainforest, or enjoy a moderate hike along the trails of Arenal Volcano National Park, crossing lava fields and pausing to soak up and photograph spectacular up-close views of the volcano. Enjoy a full day at leisure. This morning, you may wish to take an optional river safari down the Penas Blancas River, or for the more adventurous, an exhilarating white-water rafting expedition on the San Blas River is also available. Alternatively, you could simply explore the resort or relax in the soothing waters of one of the region’s many hot springs, said to hold healing and medicinal properties. This evening, roll up your sleeves for a hands-on cooking demonstration, and then savour the local flavours of Costa Rica during a traditional, homemade dinner. Today, you’ll head to the Pacific Coast. Along the way, stop for a jungle crocodile safari and birdwatching excursion; hop aboard a safari boat to explore the remarkable mangrove ecosystem of the Rio Grande of Tarcoles, home to one of the world’s largest wild crocodile populations. 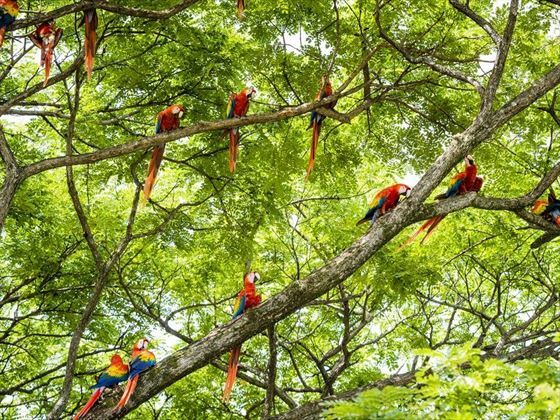 During the excursion, observe waterfowl, iguanas and over fifty varieties of native birds, including the extremely rare scarlet macaw. 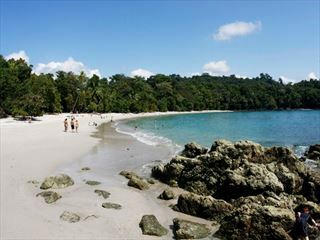 From here, you will continue to the world-renowned Manuel Antonio National Park. Check in to your hotel just outside the park, and spend some time soaking up the sweeping sunset vistas before dinner this evening. This morning, you will wake to spectacular views and a cool sea breeze as you enjoy breakfast. The day is completely yours to relax and enjoy your stunning surrounds; you could walk the nearby nature trails which lead to dramatic views of the Pacific, head to the gorgeous white-sand beaches or spend the day enjoying the luxurious amenities at your resort… the choice is yours. 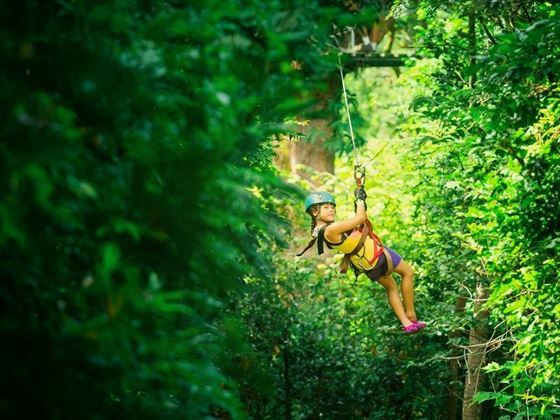 You’ll spend this morning exploring the magnificent Manuel Antonio National Park, renowned for its sublime pristine beaches and primary forest. 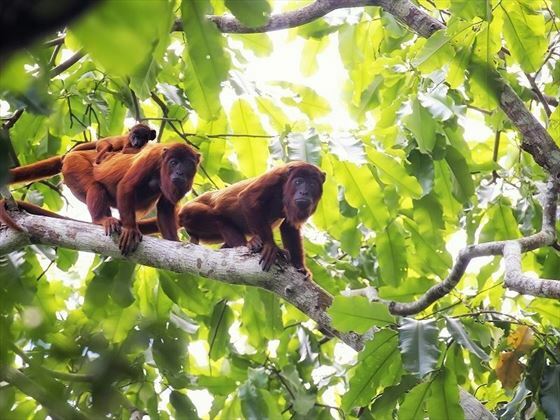 Spend time exploring the forest trails in search of three-toed sloths, agoutis, squirrel monkeys and iguanas, or take a swim in the inviting, azure waters. Then it’s time to wave goodbye to the coast as you continue to San Jose, delighting in a wonderful farewell dinner later in the evening. Your magnificent tour draws to an end today – check-out of your hotel and transfer to the airport in time for your departing flight home with many amazing memories to cherish.